Western blot analysis of extracts from NK-92 and SH-SY5Y cell lines using GATA-3 (D13C9) XP® Rabbit mAb (Biotinylated). 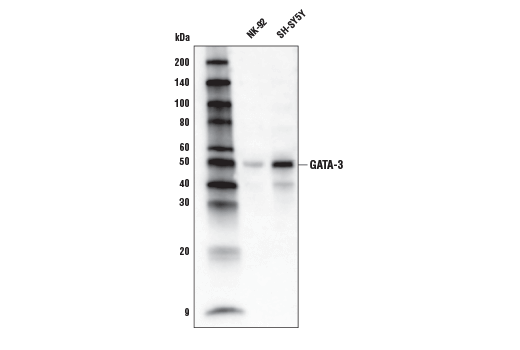 GATA-3 (D13C9) XP® Rabbit mAb (Biotinylated) recognizes endogenous levels of total GATA-3 protein. Monoclonal antibody is produced by immunizing animals with a synthetic peptide corresponding to residues near the amino terminus of human GATA-3 protein. This Cell Signaling Technology antibody is conjugated to biotin under optimal conditions. The biotinylated antibody is expected to exhibit the same species cross-reactivity as the unconjugated GATA-3 (D13C9) XP® Rabbit mAb #5852. GATA proteins comprise a group of transcription factors that are related by the presence of conserved zinc finger DNA binding domains, which bind directly to the nucleotide sequence core element GATA (1-3). There are six vertebrate GATA proteins, designated GATA-1 to GATA-6 (3).